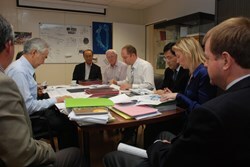 Hans Decamps from the Heating and Current Drive Division, the neutral beam team and Director-General Motojima during the last briefing prior to signature. During the month of December, six Procurement Arrangements (PAs) were signed, bringing the total for calendar year 2011 to 19. Since 2007, the ITER Organization has signed 66 Procurement Arrangements, representing more than 75 percent of the project's in-kind value. Another sixty are in the pipeline: the total number of Procurement Arrangements for the ITER Project is currently forecast to be 126. On 12 December the Procurement Arrangement for the Port Plug Test Facility was signed with the Russian Domestic Agency. This facility will enable the testing of the upper and equatorial port plugs before their installation in the machine. The following day, the European Domestic Agency countersigned the contract for the R&D and preparatory design of the magnetic electronics and software needed for ITER's diagnostic systems. On 21 December, Russia signed a second Procurement Arrangement, this time for the high field side reflectometer, part of the diagnostic system. Also on 21 December, the Procurement Arrangement for the blanket remote handling system—necessary for the remote replacement of blanket modules inside of the ITER vacuum vessel during machine maintenance operations—was signed with the Japanese Domestic Agency. A further two Procurement Arrangements were signed by the ITER Organization this month: power supply for the heating neutral beam and the high voltage bushing for MITICA, which is part of the Neutral Beam Test Facility. These two Procurement Arrangements, signed by ITER Director-General Osamu Motojima, are currently with the Japanese Domestic Agency which has committed to sign them before the end of the year. "Preparing Procurement Arrangements in 2011 involved all the Domestic Agencies and all the technical departments within the Organization," says In-Kind Management Section Leader Mark Robinson. "The Procurement Arrangements span the whole range of design types from functional specifications to build-to-print. On behalf of the in-kind team I would like to take the opportunity to thank all the supporting staff in the ITER Organization and the Domestic Agencies for their contribution and expertise provided throughout another busy year."